A cmb file extension is related to the Xtree for Windows, a file manager for Microsoft Windows. A cmb file stores button bar. The cmb file extension was also used by Xtree for Windows, a successor to popular Xtree gold file manager for DOS. The cmb file used in Xtree contains Windows button bar. This cmb file type entry was marked as obsolete and no longer supported file format. 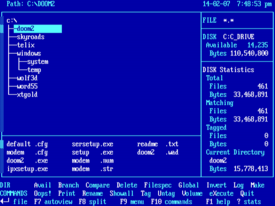 XTreeGold is a file manager for MS-DOS operating system released in 1985. It is very popular because contains benefit of requiring very little memory, essential at a time when less than 640kb of memory were available for programs to run. The last version was released in 1992. The XTree Company was acquired by Symantec the developer of rival file manager Norton Commander in 1995. As far as we know, this .cmb file type can't be converted to any other file format. This is usually the case of system, configuration, temporary, or data files containing data exclusive to only one software and used for its own purposes. Also some proprietary or closed file formats cannot be converted to more common file types in order to protect the intellectual property of the developer, which is for example the case of some DRM-protected multimedia files. Click on the software link(s) for more information. Suggested software applications use cmb file type for internal purposes and/or also by different way than common edit or open cmb file actions.